I have been working on planning out so many fun things in July and August! Between our family trip and the Stampin' Up! convention I wasn't sure how July would have time for classes. I will be posting these events on my demonstrator website and my Facebook page with further details. I hope you like what I have offered, please let me know your thoughts! July 11 2-5pm Paper Pumpkin Playdate: Bring any of your kits or you are welcome to use part of my kit for $5. RSVP due by July 3, free for subscribers, $5 for guests. July 13 6:30-8:00 Technique class: Kinda Eclectic stamps with inked embossing folder. You will take home 2 cards and an embossing folder. In Nampa at Flying M Coffee Garage. RSVP and $15 due July 3. July 14 6:00-8:00 Travel Case and cards: card case with handle, 4 cards, and full pack of English Garden Designer Series Paper. Held in Boise at Backer home. $15 for second gift set option. RSVP and $25 due by July 3rd . July 17 1:00-3:00 You’ve Got This: 4 friendship cards. RSVP and $15 due by July 10. August 1 4:00-6:00 Paper Pumpkin Playdate: Bring any of your kits or you are welcome to use part of my kit for $5. RSVP due by August 1, free for subscribers, $5 for guests. August 4 6:30-8:30 Tin of Cards: Kit plus use of my ink and stamps. $35. Add a second kit to make for a gift $30. You must bring or order from me a Tombo liquid glue and SNAIL adhesive, scrissors and bone folder (optional). RSVP and $35+ due by July 17. August 26 1:00-3:00 Pretty Petals 6 Cards to complement “Tin of Cards” kit using “Pretty Petals” Designer Series Paper Stack and Tin of Cards stamps. RSVP and $18 due by August 18. Isn't this an adorable project? 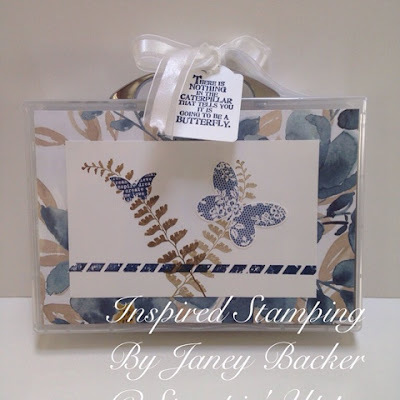 I love that my friend Bonnie Carrington was innovative with our stamp cases. This makes an awesome portable case for a card collection to gift or to enjoy yourself! 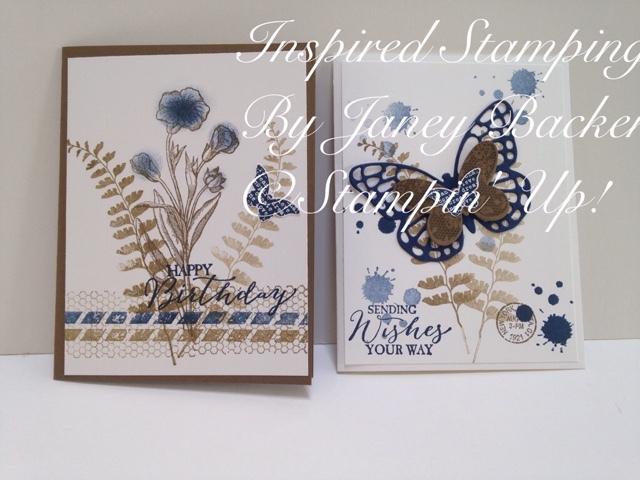 I updated her ideas with the new English Garden Designer Series Paper to coordinate with the adorable Butterfly Basics stamp set cards. Night of Navy and Soft Suede are a stunning combination on these cards.